But on the agenda: a visit to DH’s cousins in Aberystwyth (with an indulgent hotel stay en route), and a stopover in Bath on the return trip. Friendly cows welcome us to Molleston. Early in the week, we explore Lynmouth’s picturesque harbor, more villages, and Exmoor National Park. 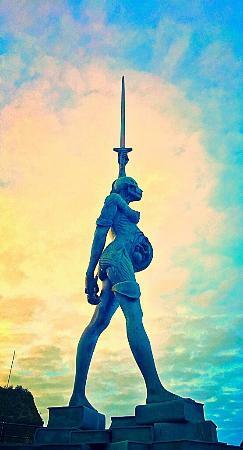 We stop in Ilfracombe, notable for its controversial Damien Hirst “Verity” statue which depicts both her pregnant exterior and interior. Erected in 2012, the statue looms over the harbor and is on loan to the town for 20 years. Many residents are counting the days until it’s removed. Are you a fan? Our drive back to Peppercombe takes us through more villages — one where a thatched roof is being repaired. And of course we see mehhhnnnny sheep! Mid-week, it’s off to Wales. You know you’ve arrived when highway signs are in both English and Welsh and towns have romantic-sounding names such as Dyffryn Arth and Llansantffraed. Useful phrases: ARAF (Slow), CYFLEUSTERAU CYHOEDDUS (public conveniences) and CERDDWYR EDRYCHWCH I R CHWITH (pedestrians look right). The first night, we stay at The Grove-Narberth, which is nothing short of fabulous. Beautiful setting and a wonderful restaurant. Naturally, they grow their own herbs and veggies. Dinner is delish, beginning with amuse-bouches in the bar while we wait for our table. We stagger to our charming room, complete with fireplace, and nod off. Oh, it is SO nice to be in a hotel! This entry was posted in Food & Recipes, Travel, Uncategorized and tagged bloggers 50+, Devon, great hotels, road trips, travel in style, UK, Wales, wordpress on December 12, 2018 by adguru101. I spent ten days in Wales during my UK jaunt this summer-charmed and delighted, but curious where the tourists were? What a perfectly lovely country. I feel the same way about Sicily: not exactly “undiscovered” but wonderfully untouristy.